It might seem to be the most intuitive gift you can give a new baby, but it really is not that helpful. Many of us know someone that has had a baby and given us some hand me downs. 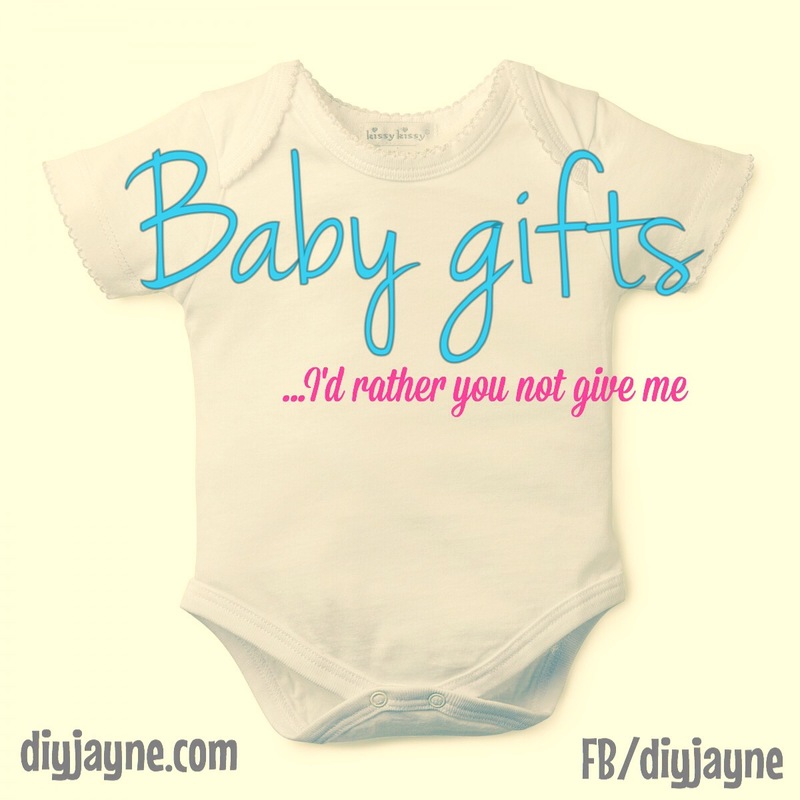 Chances are we already have a good stash of clothes to fit the baby by the time he or she arrives. If you really must buy us clothes, consider buying in the 6-12 month range, and purchasing from a second hand store. Some of us who have big babies don’t even end up using our 0-3 month clothes for very long. Furthermore, there really is no need to buy “new” clothing items for babies at this age, as many items in the thrift shop will be new or like new anyway. Some people’s babies completely bypass certain wardrobe items based on seasonal inappropriateness of sheer size of the baby when they were born. It is just super wasteful to buy new items when you can re-use. And if you do buy us clothes, please consider buying us functional items. We don’t need fancy dresses and awkward coveralls that will just sit in the drawer because they are difficult / impractical to use. Get us some onesies, soft pants, or zippered sleepers. Do not even consider buying me something with buttons. Snaps I will tolerate. Buttons? Seriously, it’s 2015 here. Take a look at the item and see if it will be difficult to get on and off of baby, or if it will impair their movement at all. If the answer to one of these questions is yes, it will likely just sit in the drawer and go to the thrift shop. Finally, please avoid buying things that say “little princess” or “Daddy’s MVP” – just no. It may sound cute to you, but many of us don’t like to genderize our kids this way. Best to buy items that don’t have text at all, just fun colours and patterns please! You know what I’m talking about. Those god awful thick, sweaty sets that come with a blanket and a matching stuffed animal, or any other such mishap. Babies don’t do well in polyester blankets. They don’t allow baby’s skin to breathe. Cotton / natural fibres only, please. And we don’t need a matching stuffed animal to go with it. In fact, just no stuffed animals in general. Especially if I have an older child as well, because then it just ends up in their already massive collection that began when they were a newborn getting matching stuffed animals and blanket sets. And everyone thinks we need a blanket, so we end up with 10 blankets that take up half the closet. If you are going to buy us blankets, go for the Aden & Anais swaddlers or other such muslin lovelies. Especially because they are too expensive for me to justify purchasing myself! It’s sweet and all, but it’s just another thing that I have to dust, and that eventually may get thrown on the ground and broken by my children. There is going to be enough baby related stuff around that serves a functional purpose, that I don’t need to add to the clutter with a decorative item. Please just leave that stuff in Pier 1 and walk away. Walk. Away. Well, I am so glad you asked. If you know someone with a new baby and you want to help out by gifting, here are some ideas for you, in addition to the suggestions already mentioned above. 1). Money. Seriously, write us a check. So many things come up last minute that you weren’t expecting. You may have bought something that didn’t work out and need to purchase a different item. There are so many large items that you need as a new parent that you can’t expect any single person to fund in their entirety, so it’s nice to pool money towards these things. Not to mention just the ongoing costs of things like diapers or a diaper service, formula for moms who are unable to breastfeed, food for that super hungry new breastfeeding mama, childcare costs……the list goes on. 2). Food. Come by with some yummy take-out. Prep us some freezer meals. Give us some restaurant or grocery store gift cards. We always need to eat, and it is so lovely to not have to worry about cooking a meal when welcoming a new addition. 3). A quality toy or activity for my older kid. Read: an educational and preferably quiet toy or activity, hopefully not composed of cheap plastic. Or better yet, come take him out to the park to play. He is likely feeling neglected with all the extra attention going to baby. Showing him some love is showing some love for the new baby, as the emotional balance hangs by a thread in the early days. The more balanced everyone is feeling, the more quality time can be invested into the new life. 4). A one of a kind, handmade item for baby. If you really feel the need to give us a token for the new arrival, consider purchasing something that is special, ethically sourced, and uniquely crafted – or handmake yourself. Again, make it something that baby can use later on and not just for a few days in the early weeks (ie. don’t knit me a sweater that only fits up to ten pounds – if you put that much effort into something, I want to be able to use it)! One beautiful idea of something to purchase is a Bamboletta doll or something similar (there are many beautiful creations for babies on Etsy). Something unique and made with love, that this child would use for years to come. And something we definitely could not afford to purchase for ourselves! So for all of you who have been wondering what I’ve been up to for the past nine months, well – I’ve been growing a baby ;). And I just had the most fantastic home birth, unassisted by a licensed practioner. That’s right, no doctor, no registered midwife. Tell on? I shall! My most recent birth story really begins at my first birth, which was an emergency cesarean that likely could have been avoided. I went through a typical “pit-to-distress” scenario where the doctors rushed my labour after my waters had broken (likely due to an unnecessary membrane sweep the day prior on my EDD). After I “failed to progress” in the timeline the doctors would have wanted, I was given an epidural and pitocin, both of which inhibited any feeling of the urge to push – so I proceeded to push in a guided fashion for more than five hours before they decided he was “stuck” and took me to surgery. After he was delivered, I spent two hours separated from him while my husband struggled to figure out where I was or what was happening that was preventing my connection with my newest family member. I remember crying for my baby and receiving zero sympathy from my attending nurse, all the while being threatened with my baby receiving formula if I “didn’t recover from the anesthetic soon enough.” I was denied the initial moments of what would have been extremely beneficial skin to skin contact, which I feel impaired my breastfeeding relationship and bonding with my newborn son. I will never forget the grief that was our separation during this time. After this traumatic birth, I was determined to become more informed on birth in general, and not to ever experience unnecessary trauma like this again. I researched and researched, and soon found that the hospital policy of keeping mom and babe separated, along with all the unnecessary interventions I had experienced, were not evidence based practice at best, and unethical and borderline abusive at worst. So I went seeking registered midwives to attend my birth, as I hoped the experience with them would be less medicalized and more conducive to natural childbirth, with less interventions and more direct support for our family. Like, say emotional coaching and support for both myself and my husband that would leave us feeling more confident in trusting the natural process of birth and coping with the physical sensations and experiences involved. My experience with the midwives seemed to be going well, but I was disappointed to learn that most registered midwives in the province would not do an out of hospital VBAC as they found it too risky due to increased chance of uterine rupture at the scar site, and a repeat of whatever conditions had necessitated my cesarean in the first place. This made me slightly uncomfortable, but my midwives agreed to attending the birth at a hospital that had more up to date practices that would allow mom and baby to recover together after a cesarean, should that become necessary again. I also looked into my legal rights and had put together a substantial birth plan that would leave me with the confidence to refuse and unnecessary interventions anyone tried to push my way. However, at 36 weeks, my midwifery team abruptly informed me that they would not be able to stretch their resources to attend my birth at my chosen hospital, and should I wish to continue with my birth plan, I would have to transfer my care to a different midwifery with seven midwives on staff. My trust was broken, as I felt that my midwives should have forseen this difficulty in their practice prior to offering my this option for my birth. I felt, if they are going to back out of this, what other issues am I going to have when it comes time for my birth? And how am I going to connect to an entire new team of seven midwives with only a month before my due date? I also was unhappy to hear them applying the term “high risk” to my delivery, as from my research, I was actually a very good candidate for a VBAC considering it had been almost three years from my last delivery to my conception date, and that I had gone to full dilation and pushed during my first birth. All of these conditions allowed for a much smaller risk in uterine rupture (which is already a very small risk to begin with), and post cesarean related complications. Furthermore, given that I was basically induced due to the membrane sweep prior to my first birth, I likely had not gone into labour at the right time, which had opened the door for complications in the first place, which had then been exasperated by all the interventions applied. Thousands of women have had perfectly natural, successful VBACs with similar histories to mine. Yet I was “high risk”? This was another red flag for me, as it seemed their classification of me as such was not based in sound evidence, andwould likely lead to more fear based unnecessary interventions. I left looking for other options, and my immediate thoughts were to contact a private “traditional birth attendant” who would attend an HBAC and approach my birth with evidence based information based in instinctual birth and traditional methods. We had considered this path to begin with, as it was recommended highly from a few acquaintances, but had balked initially at the cost – a traditional birth attendant is not covered by MSP as they are not a registered medical practitioner. A birth supported by such a professional is considered “unattended” in our province. Well, contact her I did, and what a magical journey we began after doing so! My birth attendant came directly to my home for my pre-natal visits, checked up on baby and I with traditional, non-invasive methods (for example, checking baby’s heart rate with a stethoscope instead of utilizing the possibly damaging ultrasound based audio doppler, and avoiding unnecesssary vaginal exams). We discussed how a hospital birth actually can actually increase health risk and mortality for women and babies, due to the unnecessary and escalating scale of interventions that are applied and encouraged there – induction when going past your due date, treatment with drugs and painkillers that reduce your natural connection to your sensations and your instinctual urges (not to mention crossing the placenta and affecting baby), discouragement from eating or drinking normally when your body may in fact need such nourishment to promote your strength and wellbeing – among many others. Not to mention the fact that you are naturally more comfortable in your own home environment, which psychologically leads to an increased ability to “open” into your birth and push that baby out. We decided on having a water birth in a home birthing pool with zero interventions unless one became necessary for emergency purposes – in which case i would be transported by ambulance to hospital. I had hired a doula months earlier who would continue to support me for my home birth – trained in hypnotherapy and energy work on many levels, my doula would be there to support me emotionally through painful sensations, helping me to feel safe in the physical experience of labour – we discussed how she would be there to help me psychologically open myself to trusting the natural birth experience and avoiding the urge to seek interventions that my body did not need. We also discussed how important it was for me to have my husband more involved and empowered at this birth. The hospital birth was such a helpless experience for him, feeling powerless to do anything when constantly ordered around and interfered with by nurses and doctors – and then being left alone with our newborn while I “recovered” elsewhere. I wanted him to feel like he was doing something to make a difference in the process – like he was supporting his family and having some control in the experience. Our birth attendant was happy to support us in this way by coaching my husband on what he could do for us during the birth. My baby “cooked” for a week past my EDD, which was perfectly natural and not a cause for concern for my traditional birth attendant. It is not natural for all babies to spontaneously emerge at exactly 40 weeks – some babies need more time in the womb, and ovulation dates are rarely exactly determined in the first place. So we happily proceeded to wait until she was ready, which was a beautiful, clear spring morning on a Saturday. I woke at 6 am with mild crampy contractions, and knew it was the day. I made french toast for myself, hubby, and my three and a half year old son, woke my husband up leisurely and told him it was time. Boy, were we excited for this brand new experience! After breakfast, we headed to a local park and spent some time enjoying the outdoors. My friend, our birth photographer, happily met us at the park and snapped some shots. ﻿I called my doula and birth attendant and around lunch time I was feeling like it was time to get home. I ate a small delicious meal on the couch. My sensations were getting stronger, closer together and very regular. Another friend who is also a doula came by to be with us also – my doula, friend and I laboured together in my living room while my husband busied himself tidying and taking care of us. My friend and doula did a beautiful traditional aboriginal smudge with me using sage and cedar, which I felt truly helped me release many of my remaining tensions and fears. My son played with his Nana outside while my labour continued progressing. It was so important having my son there for us, as we felt that he would learn so much, and feel more comfortable being there amidst all the action, rather than spending the night away at another house feeling curious about the goings on. I also felt strongly that seeing a peaceful, lovely, natural birth would help him heal on some level from the trauma of his own birth. We had prepared him for it by talking a lot about what birth was like, watching birth videos, and very much normalizing the process rather than allowing fear to permeate. He was calm and curious during the whole process, and my doula would help connect him to the birth and to me and Daddy throughtout. I moved to the bathtub on suggestion of my doula when sensations were getting harder to cope with and impossible to talk through. This helped ease the intensity somewhat, and we had the lights dimmed. I felt an intense pressure in my head, and my doula guided me through a visualization that involved sending light up and out the top of my head, and back in again to swirl around in my belly. This eased the intensity of this pressure immensely! At this time I started also feeling quite nauseous and threw up a couple times. In hospital, this had been a cause for concern which had me hooked up to fluids immediately. At home, we moved past this right away as just a natural part of the process. My birth attendant had arrived, and I was feeling increasingly overwhelmed by my sensations, although still coping very well through my doula’s amazingly intuitive coaching and the support of my husband who I now had holding my hand through each sensation. He felt happy and confident to be there for me when I needed him close. My doula described later how he was seemingly thrilled that I needed him to be there for support. At the hospital, I had felt so paralyzed in fear and pain that I hadn’t wanted him touching my body at all. At home, if he let go of my hand, I felt like I immediately lost stability. We moved with some difficulty to my bed where I felt I could labour more in comfort, as I was feeling increasingly exhausted with sitting up in the bath. The sensations were almost one on top of the other at this point and so intense I found myself longing for painkillers! I was however very thankful that they weren’t available to me, as I knew I didn’t “really” need them, it was just old conditioning peeking through. I was glad to be home where I could be in the comfort zone I needed to push through without drugs. As an aside, I want to speak to the incredible benefit that is having a doula present that you are in tune with. My doula knew just what I needed on a deep, spiritual level, and spoke to it or brought it for me without question, allowing for as peaceful and uninterrupted a labour as possible. All I needed to do was connect with my sensations and focus on being strong in the moment. She was there to suggest to my husband what he might do to assist me, and to support him as well if he needed a break. I can’t say enough how valuable a well chosen doula is for a healthy, natural birth, at home or in hospital. Just as I felt I couldn’t handle a single other sensation, and while I was wondering what pushing would be like and when I would know it was time, my body just transitioned immediately into pushing – I pushed without thinking, and my mucous plug loosened and my waters broke on the bed. I knew it was time to push and didn’t even have to choose to do so – my body just did it on it’s own without any conscious input, and it felt amazing! I knew it was time to push my baby out! We had progressed so quickly that we hadn’t had time to set up the birth pool – however, I didn’t feel I could have maneuvered myself in it at this point anyway and was happy staying where I was. Not once was I checked for dilation – a practice which has proven largely unnecessary and invasive. Not only can you introduce pathogens to the mom and baby if you do so, but you can disturb the natural peace and progression of things without any proven benefit. The only thing a dilation check can do is really promote a questioning of an “appropriate” timeline for your birth, which raises anxieties and creates unnecessary expectations. Not to mention creating a great deal of discomfort. At this point my husband recalls that he was surprised at the strength in my hand, finding he had to squeeze back so I wouldn’t crush his fingers – all those sitcom births with moms crushing hands had actually found a bit of truth there amidst the ridiculousness of dramatized births. I found myself going into a loud, guttural roar during my pushes and thought “Wow, my throat is going to be wrecked after this,” but not caring at all. I needed to growl! My doula encouraged my son to “make the sounds with mommy”, and he was happy to growl along with me as I pushed his sister out. I truly believe it was a beautifully illuminating and powerful learning experience for my first child. After about an hour of pushing, we could tell it was close – my birth attendant encouraged me to push gently to avoid tearing. As I felt I barely had any strength left in my body, everyone hoisted me up onto a special birth stool that my attendant brings to all her births. I pushed my little girl’s head out on the stool and my attendant told hubby to “get ready to catch your baby!” Her shoulders came out easily and she slipped gently through husband’s hands onto the towels on the floor – we weren’t prepared for how wriggly and slippery she was! He quickly scooped her up and passed her to me – I almost dropped the slippery little love also but was supported by all the lovely ladies around me. She almost immediately wanted to check out my breast, and she was so lovely to behold. I enjoyed holding her for some moments, and then my birth team hoisted me up to recover and birth my placenta on my bed. The placenta came out without issue, and we delayed clamping her cord until an hour later. It was so wonderful to snuggle up right in my own bedroom with my lovely baby and not to have to worry about anybody poking or prodding us with unnecessary procedures. I was brought beautiful nourishing food, along with a piece of my placenta to swallow. I was so well taken care of that all I had to do was savour snuggling up to my newest little munchkin. A friend came shortly after the birth to encapsulate my placenta right in my home. I can’t express enough how empowering it was for my husband and I to have our HBAC. My husband continually expresses his amazement with how my body just knew what to do, and how incredible it was to just be supported in trusting the natural birth process. I birthed my lovely 9 pound 6 ounce baby girl with no interventions – only love, emotional support, and very gentle coaching during the last stages of pushing, and my baby was here! She was lovely and pink and wonderfully healthy and alert. Breastfeeding started easily and quickly. A night and day experience from the hospital. My birth attendant stayed with us overnight to make sure my bleeding slowed and that we were comfortable. We were so well supported and loved, and continued to be for the weeks following – having meals and other things delivered and being checked on regularly. I am so thankful for my beautiful natural birth, which has allowed me to heal from much of the emotional trauma of my first. I strongly recommend home birth to everyone – it is such a wonderfully empowering and healthy experience that I wish every family could have in their lifetime. If it wasn’t for my wonderful traditional birth attendant, this natural birth may not have been possible for me, due to the unreasonable restrictions and unsubstantiated fears of the medical profession. I am eternally grateful for her knowledge and experience which allowed me to have faith and confidence that traditional birth, as nature intended, is possible for most women, and in actuality the healthiest way to have your baby – despite what the medical community may try to tell you. You CAN trust your body to do what it needs to do to grow and birth your baby, and you may just have an enlightening experience if you do so! 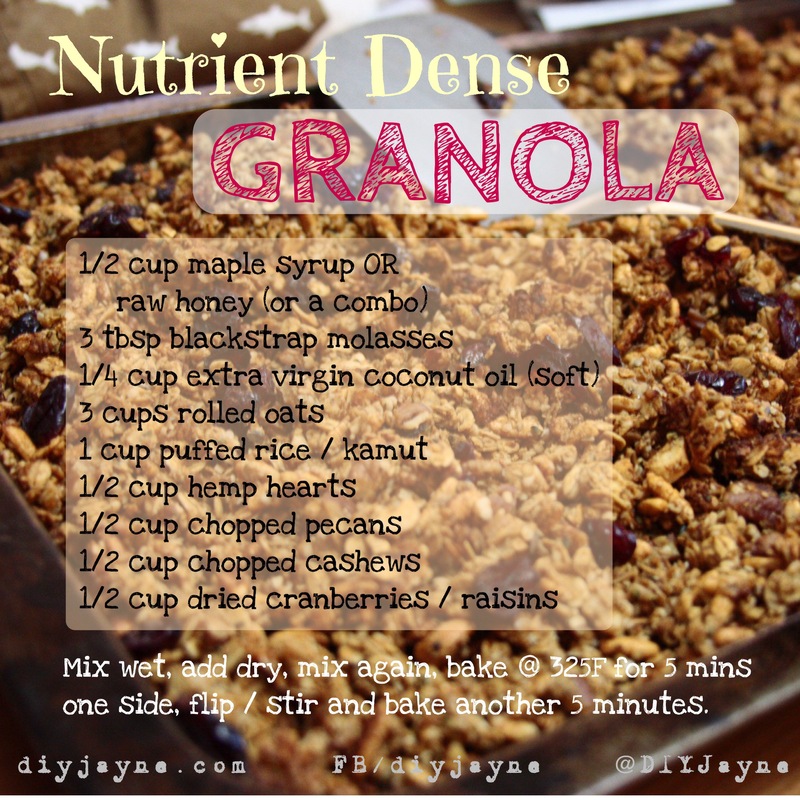 A few family members have requested my granola recipe…..as I usually just “wing it” and just add ingredients by eye, I decided to finally measure everything out and get it all down for you all! It is a super easy, vitamin and mineral rich breakfast – and when you mix it up with some full fat yogurt, it fills yours and your kidlets’ tummies for a good while. If you have a kitchen-aid, it’s unbelievably fast. Just dump in the wet ingredients, mix, add the dry ingredients, mix, and you’re good to go. Grease a large baking sheet and spread the granola fairly shallowly over the pan. Bake for five minutes or until you notice the corners browning a tad, flip, and bake again for the same amount of time. You can shake up the recipe a great deal by maintaining the same ratio of wet ingredients and oats, while switching out the puffed rice for any other type of cereal, the nuts for any other nut or large seed. The hemp hearts can also be subbed with chia – although the chia tends to not “stick” as well to the mix. You can even add nut butters to the wet ingredients if you like. So I have been actively fermenting stuff for several months now, and have to say I am hooked on it. 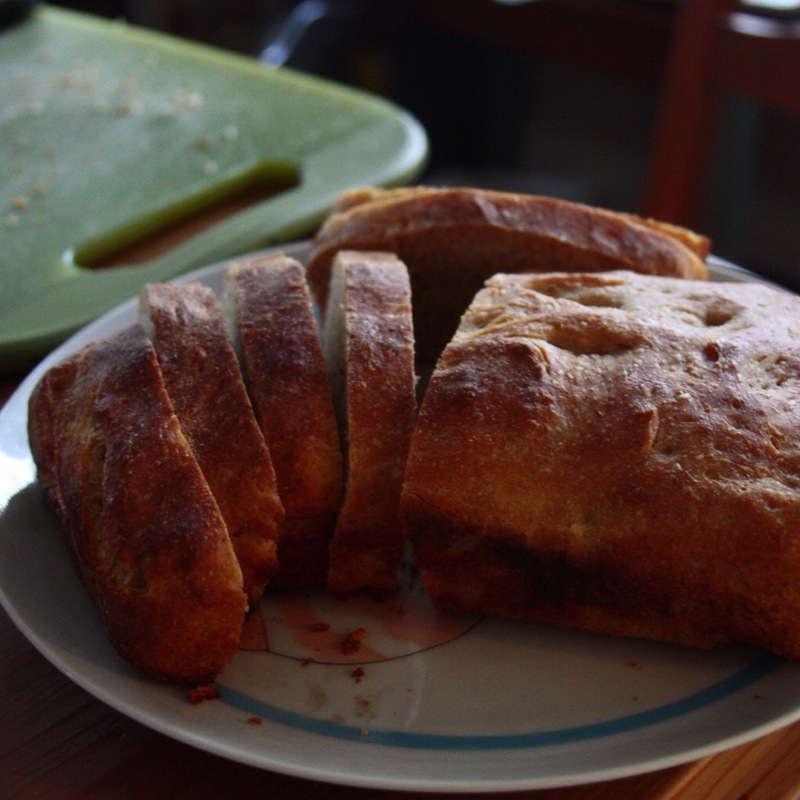 My first culture baby was my sourdough – after being inspired to make bread and discovering a sourdough loaf was one of the easiest on your gut. The sourdough experience was admittedly a nerve wracking one. I kept thinking, “How the heck do I know I’m not going to get bread mold disease or some other such horrific ailment after ingesting whatever grows in here?” My starter went through a phase of smelling like feet, where I almost threw it out, didn’t seem to be bubbling as fast as I would like – and then eventually, magically, as I kept “feeding” it, it ended up smelling like a yeasty sourdough loaf, and frothing like a champ. And I must say, the sourdough bread that followed was amazeballs. And it was easier on my digestion. I have problems with yeast in my gut and did not find the sourdough to aggravate the issue (read: bloating, etc), in fact it was the opposite. No indigestion there. Oh, and hubs was thrilled to have freshly baking bread. 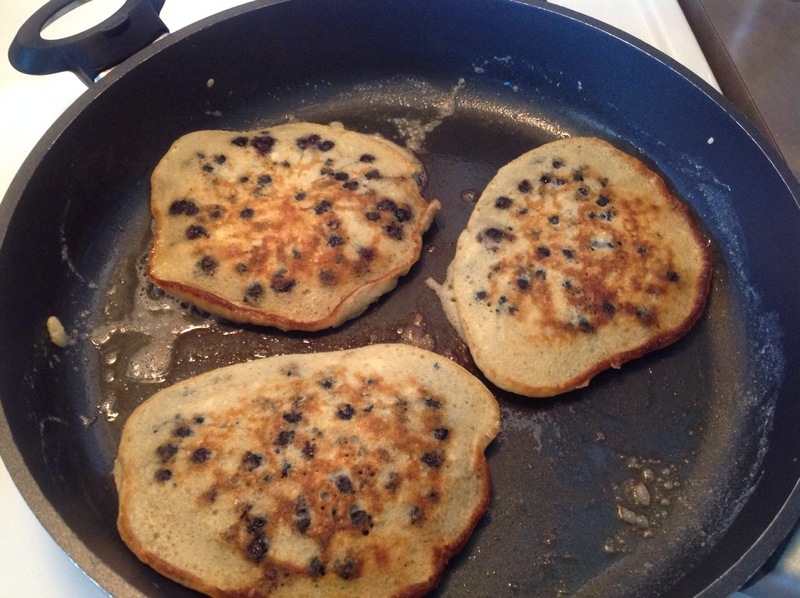 Oh, and you can even make sourdough pancakes (omit the oil, please)! So why should you feel safe to ferment your own foods at home? Isn’t there a risk of contamination? Well, yes, sure there is. But most fermenting forums and web tutorials will give you some very clear warning signs as to when you should be concerned about what you are brewing. Say, for example, had my sourdough developed black or green spots or a fuzzy layer. Garbaaage. (Some people say to scrape it off, but let’s ply the safe game here, shall we?). If that smelly foot taint never wore off – garbaaaage. But if it looks, smells like, and has whatever consistency your recipe tells you it is going for, you should be good. Spoilage of your ferments is rarely a devious process – it usually slaps you in the face (although there are some issues that may come up with a few trickier ferments that you should study your tutorials carefully for). And guess what, there is a risk of contamination of regular stuff in your fridge, too. And when you go out to eat. So although frightening at first, it’s important to remember that humans have been fermenting successfully for thousands of years. Although I really have to say I am still very intimidated by the smell of my first batch of sauerkraut. It really just smells like farts. I am really looking forward to moving on from this phase. So why should you be eating fermented foods? They are amazing for gut health! You know the ever overused term probiotics that’s been thrown around by many a company these days? Well, ferments are the gosh darn source of these healthy gut flora. Your gut flora help to keep your immune system functioning at peak level, and they also aid in nutrient absorption and vitamin production. When they get out of whack, a great deal of health problems can occur. Buying probiotics in a bottle? Somebody cultured something somewhere to make them. Eating yogurt? Yup, that’s a fermented food! One other thing to be mindful of: storebought ferments like yogurt are, more often than not, pasteurized to remove some of your contamination risk. But this process also removes a lot (if not arguably, all, according to some) of the healthy culture. So when you brew your own ferments at home, you are getting way more of the healthy probiotics that keep your intestines running smoothly. Literally. Having issues with constipation, chronic indigestion, bloating, gas? Cravings for sugars, carbs, the like? Battling a bacteria or virus that is getting chronic? You could do with some ferments to kickstart your gut flora back into proper health. And guess what, it’s waaayyyy cheaper than those expensive probiotic bottles in your health food store (especially if you are buying the higher quality supplements like Udo’s). 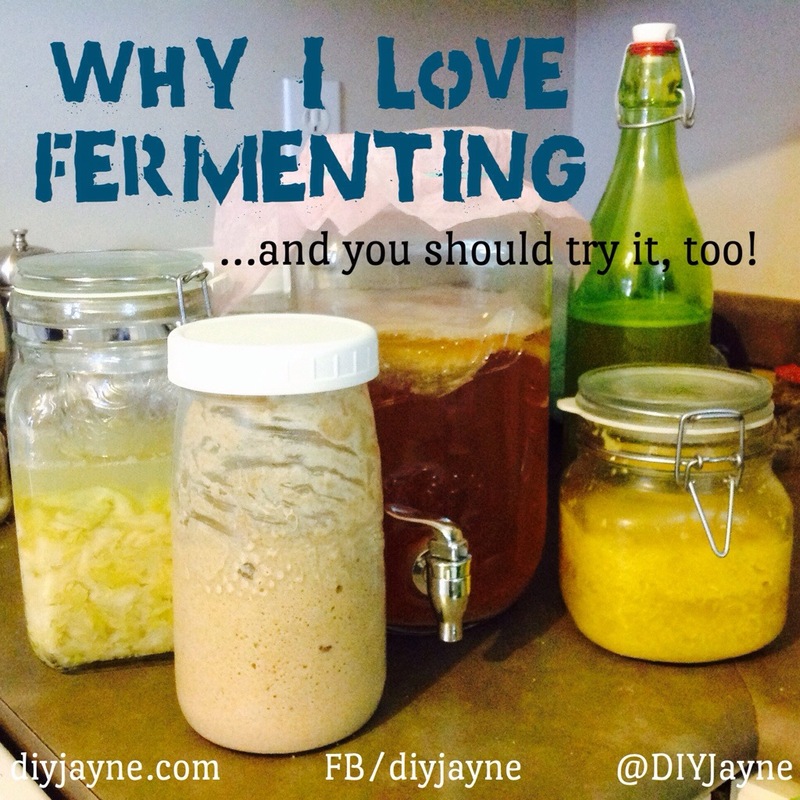 Oh, and did I mention that fermented foods are just really YUMMY? My favourites? I have to say, to date, my favourite fermented foods have been the fermented beverages I have made, especially kombucha. They are naturally fizzy and very delicious! I am going for some good old fashioned root beer next. The ones made with tea (like kombucha) sure give you a kick in the morning – no coffee needed! Cheesecloth, coffee filters, or stretchy, finely woven cotton material for covering brews that need to be open to the air (to prevent flies and such om getting in). Some wooden or plastic utensils to stir your cultures with (do not stir with metal utensils). ……and other large GLASS or CERAMIC (no metal, it interferes with your brew) containers for big brews. I suggest places like Home Sense for these if you can’t find some second hand. Beware of antique ceramics, as they may contain glazes with a high lead content. If you are PREGNANT: A little warning not to delve into fermenting if you have not previously eaten much in the way of cultured foods prior to your pregnancy. Rarely, allergic reactions to certain cultures may occur. Also, your guts may be overwhelmed by the new copious amounts of microorganisms, which might lead to temporary digestive upset or loose stools. As pregnancy already comes with it’s own digestive issues, you might want to wait to see what your reaction is until baby is here. Better to be safe, IMO! I hope that helped explain the benefits of culturing your food, and that you are keen to start on your own journey! Local kitchen stores and restaurants often do fermenting workshops as well, which may be worth checking out if you are more of an observational learner. Good luck fermenting! 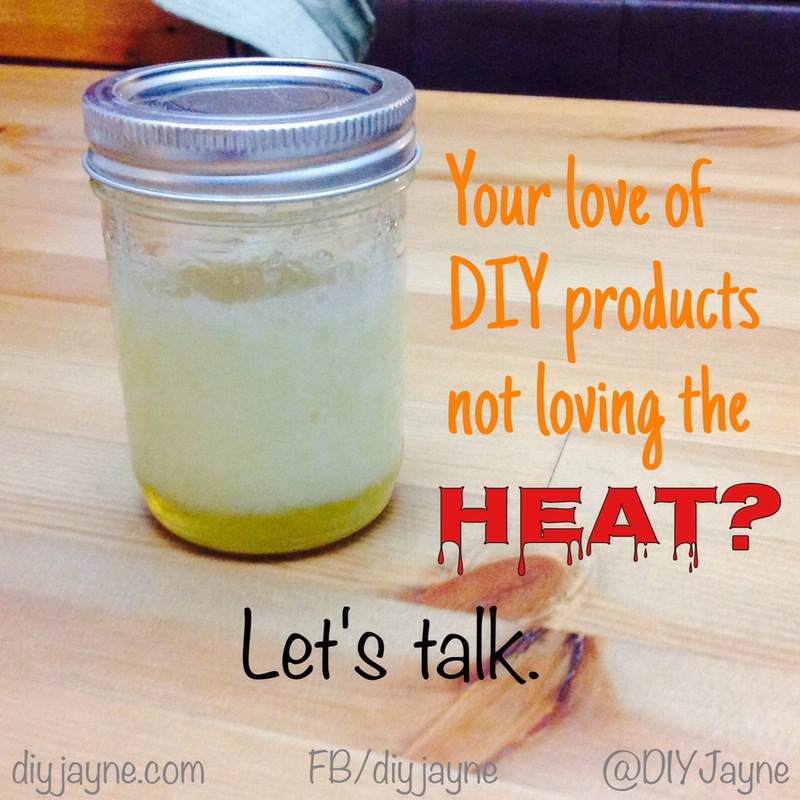 So while I simply love my original recipe for natural deodorant, I do find that some people aren’t able to use it because of their sensitivity to baking soda and / or corn starch. If over-applied, even individuals with lower sensitivity may find they need to take a break from it every once in a while, as baking soda does tend to be mildly abrasive. So I have a great alternative for you – which has been working very well for my hubby who works long, sweaty days outdoors in construction – is there a better test for this, really? I even enjoy alternating using my baking soda deodorant with this one once in a while, if my pits need a vacay from the baking soda. And it is incredibly easy to make! One part alcohol free witch hazel like THIS one. Combine in the bottle, shake and spray! If you don’t have witch hazel around, you can even skip it altogether and just use the lemon juice, although I think the witch hazel does improve the effectiveness, as well as being tonifying for your skin. The shelf life will also reduce without the witch hazel. This recipe DOES need to be kept in the fridge, which is one reason why my first recommendation is always my original recipe. But I personally don’t find it that inconvenient to just spray it on in the kitchen instead. 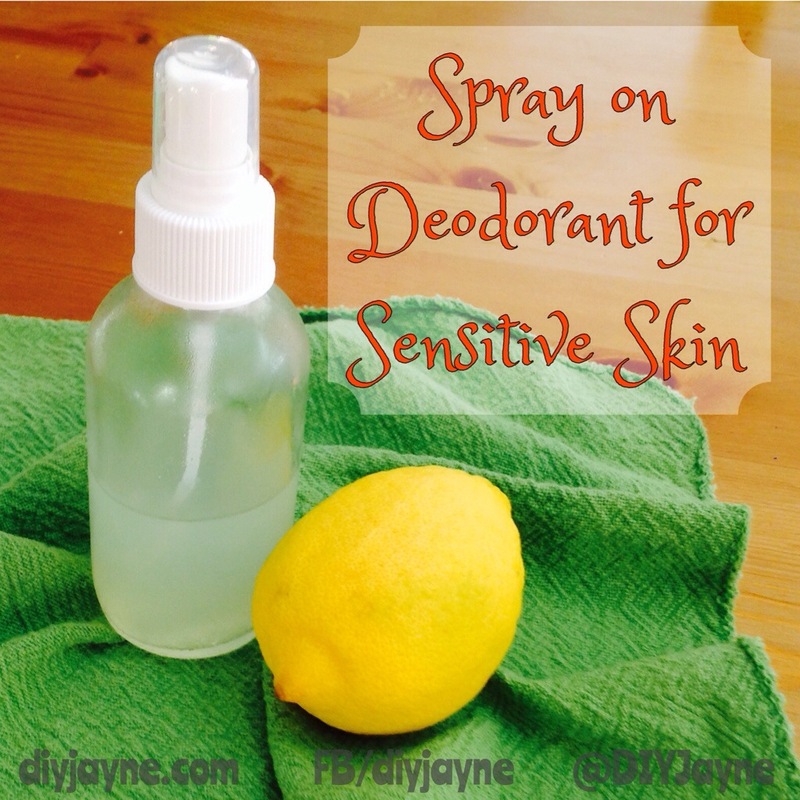 You can even just rub some juice from a sliced lemon on your armpits, if you don’t have a spritz bottle. Yup, just a lemon. Just rub it on there and go. Keep the slice in a container (you might want to mark it: “this lemon for armpits only”) in the fridge. My husband found this somehow unappealing, and thus this recipe was born. But hey, if it works for you, and is easier, go for that option instead! Give it a few minutes to air out on your pits, to avoid rubbing it all off on you shirt when you put it on. And do beware of freshly shaven armpits, the lemon juice might give you a bit of a sting if you’ve nicked yourself anywhere! How easy is that? No aluminum or other toxic ingredients, incredibly cheap, and amazingly effective. Hope you have success with it! DIY Products and Temperature Shift – How to Deal. 1). Some recipes can benefit from a higher ratio of solid / higher temperature withstanding ingredients. For your body butter, you may consider greatly increasing your ratio of cocoa butter, which holds a solid state at a much higher temperature than coconut oil, or adding a bit of beeswax to the mix. For your toothpaste, you may want to increase your baking soda content by a tablespoon or so. Play with your recipes a bit to get the mix that works for you. B). 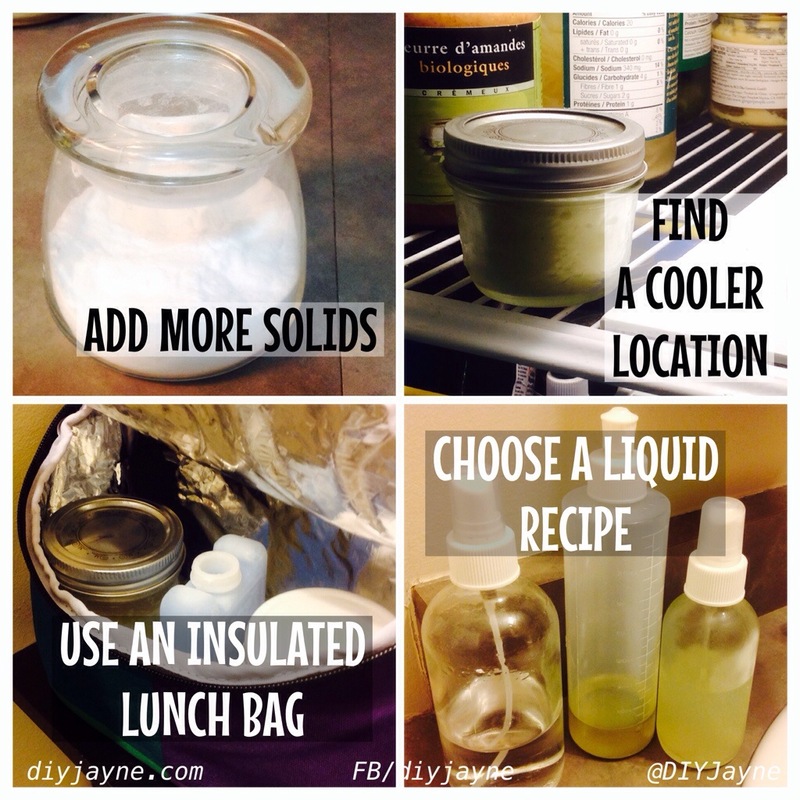 Keep a lunch cooler bag in your bathroom with an ice pack in it. I have done this in my hot bathroom, and it works like a charm. Just don’t forget to change out your ice pack! 3). Just use your recipe in liquid form, or try an alternate liquid recipe. For example, you could use my glycerin based spray on moisturizer for your skin in replace of a body butter. However, even if your body butter turns to body oil, it still works just as awesome, it’s just not as fun to apply. Consider transferring it to a squeeze bottle, or just using plain old olive oil out of a squeezer instead if you are worried about the mixture solidifying in there again. Out and about with some sunscreen or another product in danger of melting? Keep a freezer pack in your bag with it. Have a product that’s already separated or melted? Not to fear, just mix it again as per the directions in the recipe, and refrigerate or freeze to harden prior to leaving it out again to soften to workability. The only thing that might need adjustment is the essential oil content – you may want to freshen your oils up by adding a few extra drops when you re-mix, as extreme temperature changes and additional processing can cause them to evaporate off a bit. I hope this helps with your temperature troubles! So I posted my first sunscreen recipe a while back, and am extremely sorry to say that the consistency of the recipe has not proven itself to be reliable. It seems to work fine as a sunblock, we haven’t had any burns with it on (unless we’ve been in extreme conditions or forgotton to reapply) – but I really hate making the lotion, and find that it separates, gets gummy and develops hard bits in it after a while. Furthermore, I find the clean-up ridiculous using a food processor. So…..apologies to any of you who have had mixed results with that recipe. I know when to admit I haven’t gotten something totally right, and this was one of those times! And it WORKS! I am talking moderate exposure, of course. I haven’t tried this in the desert in Arizona. If you are out and about at a spray park for a few hours, at the park, spending the day at the beach (with some shade time interspersed) and reapplying once or twice, you are golden. Literally ;). I can’t attest for severe conditions, as I don’t expose my family to them – we do moderate sun exposure and seek shade often. The only time I’ve burned with this lotion on is while standing in a paddle pool with my son from 12 pm – 2 pm, after having applied it at like 9 am, and likely having the stuff on my back partially rubbing off in the car (read: human error). My son has never burned with it on, including during that same time in the pool :). Please re-apply after swimming or extended water play, as this sunscreen is not entirely waterproof (I haven’t met a sunscreen that really is, frankly). My recipe utilizes only TWO ingredients, both of which contribute to the SPF of the recipe, extra virgin coconut oil, and non-nano zinc oxide. “Non-nano” zinc oxide means that it is not penetrating your skin’s mucous barrier, and going into your bloodstream. You can buy non-nano zinc oxide online at New Directions Aromatics, or at many soap making shops or bulk ingredient stores like The Soap Dispensary. I buy my coconut oil at Costco – they have a very affordable extra virgin organic oil there, and it seems to always be in stock. Sure, you can buy zinc oxide based sunscreen, but holy moly does it ever put a dent in your wallet – and if you don’t use it all within season, don’t expect it to have held together for next year! So I choose to make my own, cheaply and simply. 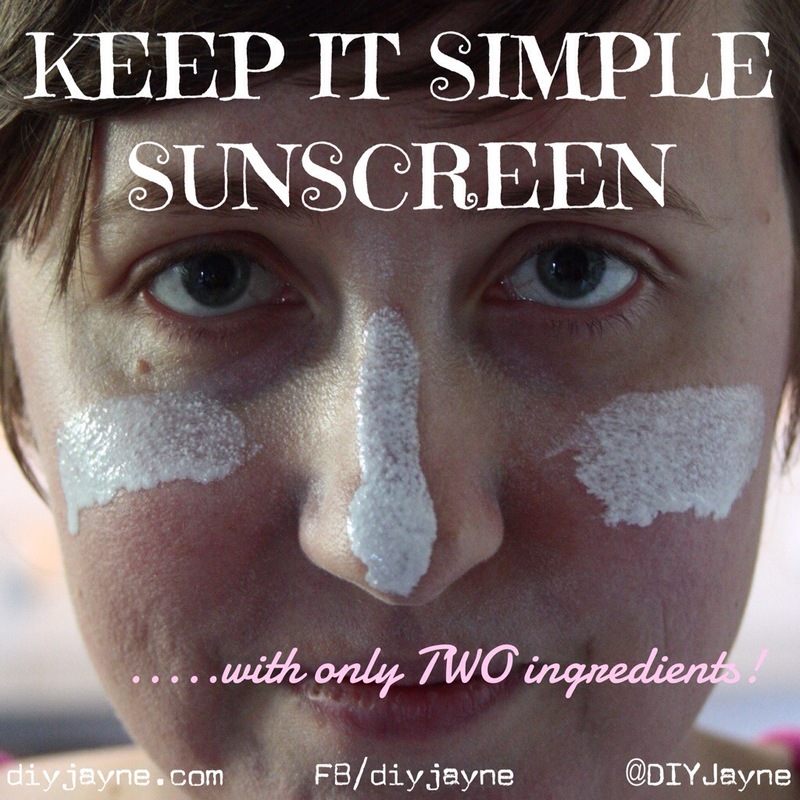 So let’s get started on how to make super easy, inexpensive, low toxin sunscreen. 1). Start with one cup of softened or completely melted coconut oil. I prefer softened only, if possible. 2). Put in a bowl big enough to mix it in with an electric mixer with beaters. 3). Add 1/4 cup zinc oxide, being careful not to inhale any (wear a mask if possible). Although fairly benign on your skin, you do not want to inhale the stuff. 4). Beat together the mixture until very well blended. 5). Put mixture in the fridge for 5-15 minutes, depending on how soft your oil was to begin with. You want the oil to cool significantly, but not become very hard or solid. 6). Beat the mixture again until it develops soft peaks and takes on the texture of a thick lotion. If it does not seem to be getting creamy, only staying soupy, you need to refrigerate a bit longer and try again. 6.5). If you would like to add some mosquito repellent qualities to your recipe, add about 10-15 drops of citronella essential oil to your recipe now, and continue blending. If you mix the same proportions as me, you will end up with a sun lotion with about an SPF of 30. But you can add more zinc if you wish, to increase the SPF – the higher proportion of zinc in the recipe, the higher the SPF – supposedly the percentage of zinc you add is your recipe’s SPF; and coconut oil has an SPF of between approx 5-10. *A note about clean-up: I caution you from just putting your bowl and beaters directly into the dishwasher or sink prior to doing a wipe down with paper towel. This will likely result in a lovely greasy film spreading all over your entire load of dishes, that you will need to hand wash to remove. I almost never use paper towel or any other disposable cleaning product in my house, but I DO use it for cleaning up zinc oxide sunscreen. It is quite hard to clean off, because it is greasy and not very permeable (hence making it a great barrier for sun protection, but not so great a barrier to clean through). So I suggest wiping as much as you can off your utensils and bowl with paper towel, and then hand washing them in a sink by themselves so as not to get the sunscreen residue all over everything. You’ve been warned! 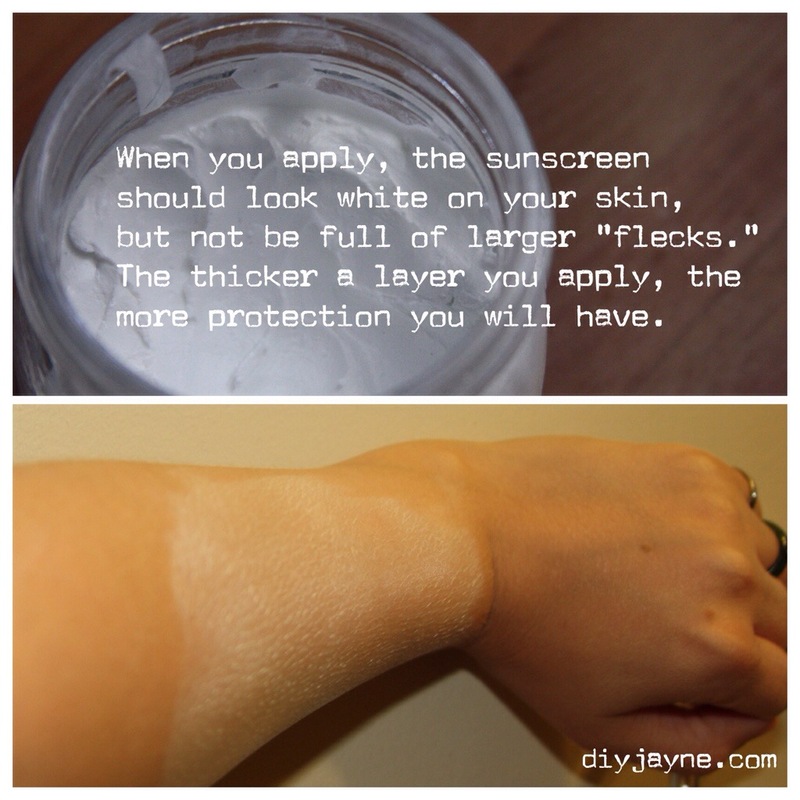 For low sun exposure, I just use my Whipped Body Butter, or plain coconut oil. How easy is that, just rubbing on some coconut oil? I can’t wait to hear what you think about this new recipe. I am super excited about how easy it is to make, and how effective it has been. Let me know how it goes! Enter your email address to follow DIY Jayne and receive email notifications of new posts! DISCLAIMER: The statements made here have not been approved by the FDA. These statements are not intended to diagnose, treat or cure or prevent any disease. This notice is required by the Federal Food, Drug and Cosmetic Act. (Maybe because they don't want you to know how easy it is to DIY?). Yada yada, I said it ;) All recipes are for personal use only. Reproduction of these recipes and articles is prohibited unless prior written permission has been granted by the author.